This article offers several useful insights for teaching evolution in the science classroom. The authors examine the teaching of evolution by applying Joseph J. Schwab's "four commonplaces" of curriculum, which provides for a balanced approach that is attentive to the learner, the teacher, the milieu, and the subject matter. 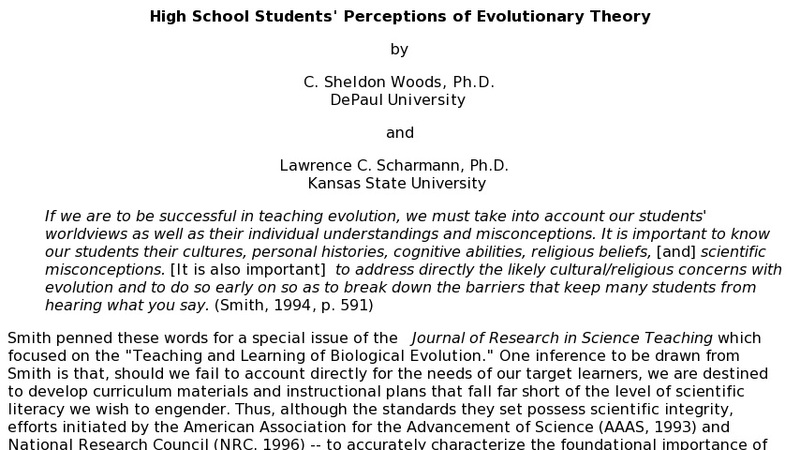 The second part of the paper presents a study of 518 high school students and their perceptions about evolution. Data is presented statistically along with sample interview responses. One conclusion is that "A majority of the students do not accept evolutionary theory or know very little about it. "The implications from this study are that teachers should take great care not to alienate students, they should educate the student" and that teaching methods should include time for reflection and discussion.